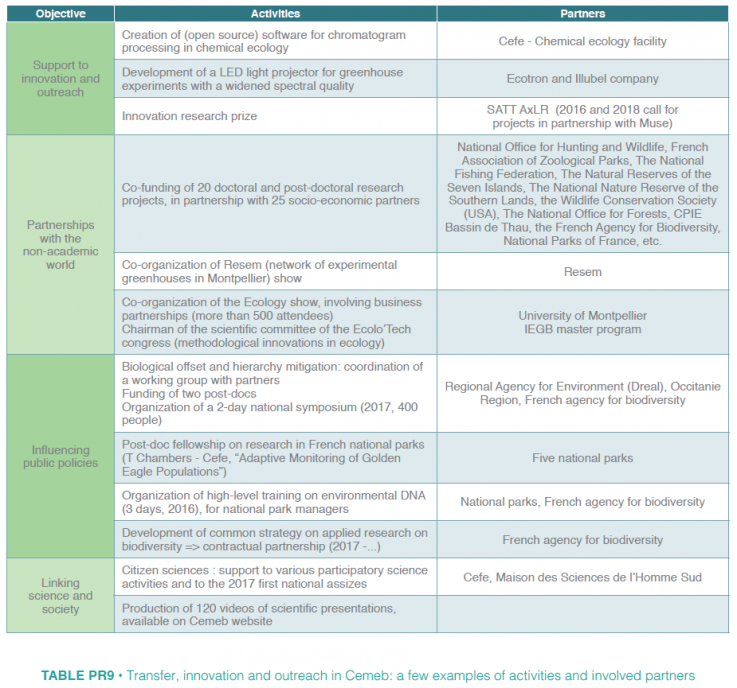 Influencing public policies on environmental issues: Cemeb develops a strong partnership (the only Labex to do so) with the French Agency for Biodiversity (Ministry for Ecological and Solidary Transition) developing research projects on biodiversity management through PhD, post-doctoral and engineer hiring to sustain the link between fundamental research and practical solutions to biodiversity issues (Table PR9). 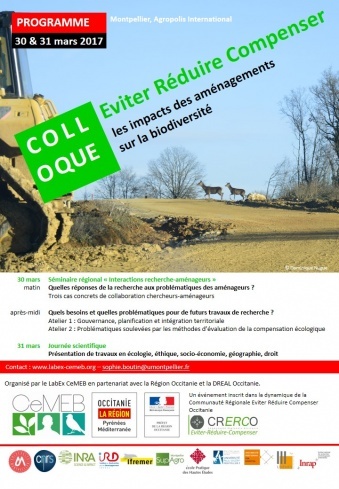 Cemeb is strategically involved in developing the ‘biodiversity offset and mitigation’ hierarchy from both an ecological and economical point of view with regional and national partners (Table PR9). Linking science and society: Cemeb sustains / organizes outreach and participatory and citizen sciences to reinforce this link on critical issues at the heart of Cemeb project (e.g., the evolutionary theory, the biodiversity crisis) through project and meeting funding (see an interesting example in Table PR9) and video production. Cemeb also sustains focused outreach activity (e.g., through the Evolution2018 congress). March 30, 2017 : Regional seminar featuring interactions between research and developpers of urban infrastructures (Government, Regions, collectivities, privates entreprises). March 31, 2017: Scientific day (ecology, ethics, phylosophye, socio-economy, geography, law).